So the holidays are firmly behind us and we are charging towards the end of January 2015 already. This is much delayed and I’m sorry for that but, well I’ve been a bit busy with other projects and kept forgetting to put up a post. Anyway thanks to the lovely Steven Paul Watson for providing this weeks photo. Not an obvious Horror Picture but I’m sure you are all up for the challenge. Happy writing. 1: Tales can be posted on your blogs & then just add to the wee linky tool, or add as a comment if you don’t have a blog. 2: A word count of 200-350. 3: Try to scare me, or at the very least create a little bit of darkness. 4: This will be a fortnightly (two weeks) challenge from when the post goes live, so you’ve got plenty thinking time. So come on what are you waiting for, go find your inner demons and get your scare on! 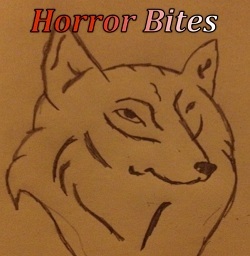 This is a continuation of the Horror Bites #11 and Horror Bites #13 challenges. Colonel Sanchez stood at the top of the ladder and looked down. "How deep is this trench?" "About eight meters, Colonel. The base is on bedrock." "And how far will the wall extend?" "Another eight meters above grade once it's finished." "And we're over seventy meters from the spot where this thing came out of the ground?" "Yes, sir. About seventy-five on average. It keeps sending out tendrils, so we went out as far as necessary and started building. Once it's up, we'll back-fill the outside with rock and soil to support the wall." "And what about the inside?" "We were hoping you, or Mrs. Henderson," the soldier said turning to the biologist, "could tell us that." "It's difficult to say what to do until I've had a chance to analyze it," she replied. "And you can call me Margaret. I don't think we have time—or the need—to be formal. Have you been able to get samples?" "We have a few. We used explosives on it and some fragments were thrown free. We had to collect them quickly. It seems to grow on whatever it lands—including organic matter, ma'am, if you understand what I mean. We have two men in quarantine now, so we can get more samples if you need them." The soldier's voice softened as he said, "At least for a while." "Blow it up? Oh. I see. So there's no hope for—"
"You can't think that way, Margaret," Colonel Sanchez interjected. "Not until we know for sure." "I'll try to remember that, Colonel. Thank you. And if we—I—can't come up with a solution to control it?" The soldier took a deep breath and exhaled. "There was some talk from Washington about filling the enclosure with concrete. But we don't really know if that would work." "That's a lot of concrete," the Colonel said shaking his head. "It would make for an impressive structure." "And a tomb for everything—and everyone—inside," Margaret added. "I believe I need to get to work." Gone were the crowds, the throngs of people who danced at the balls, celebrated holidays, and relaxed on the now-unkempt grounds. There were no visitors who called, no giggling children, no misplayed notes on the piano whose keys had long ago turned yellow. The music and laughter that once resounded through its rooms were only a dim memory in the minds of a few who remembered its magnificence. Now, only darkness and decay wandered the great halls. And one, it is said, whose forlorn face sometimes appeared at a window. My last blog (wordpress) was hacked and I ended up losing several weeks of hard work due to no back up. Do you have any methods to prevent hackers? Moderate comments for this blog. Hackers? Such as folks who post questionable links in my comments section hoping someone will click on it? Occasionally. And, yes, I actually do have methods to prevent hackers from spreading their favorite malware or virus—such as not clicking on links sent in anonymous e-mails! Also, I don't post comments like this for the protection of others. And, unlike my anonymous friend, I do make backups of my blog. It's pretty easy. In the upper right-hand corner of your screen, you'll see your account pulldown. Click on it to see the following window. Click on "Account" inside this window. I know the guy in the image above looks incredibly shady, but he will serve as an example. After clicking on "Account," a long list of items to update about your blog or tools you can use will appear. Somewhere down toward the bottom, you will see "Account tools." Select "Download data." Next, select the items you want to download. In this case, I want my Blogger posts and pictures. Once you've selected the items you want to back up, click "Next" at the bottom of the page (not shown here). On the screen that appears, you can select the appropriate file type for downloading. If you use Windows, a .zip file works. 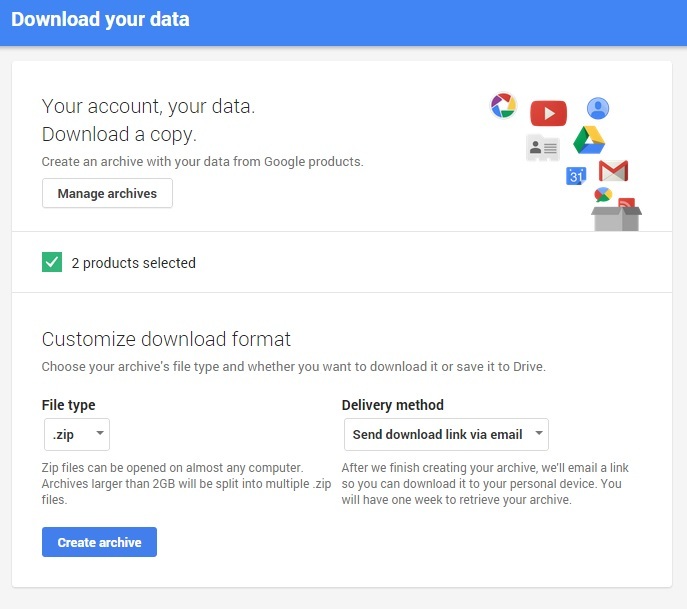 Once you click "Create archive," a file will begin being built. Once it's finished, you can see the size. With pictures included, it can be quite large. Click on "download" to save the file. The file you download will have a long name. The one I created here was: takeout-20150117T153725Z.zip. It contains two folders that holder the backup files. Inside the Blogger folder will be an "atom" file that can be used to restore the blog or move it to another blogging service. 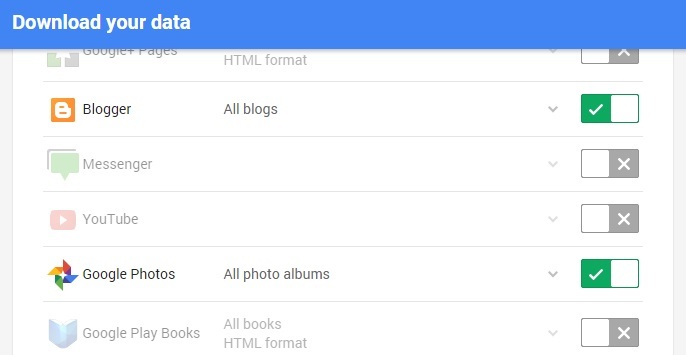 The Google Photos folder will contain a file with the images used on your blog. That's about all you have to do to make a backup of your Blogger blog! I went to see another play last weekend. This one was the pre-Broadway production of Gigi at the Kennedy Center for Performing Arts with Vanessa Hudgens playing the lead role. And I was one of those folks! The first thing I noticed was the impressive stage setting. There was an ornate staircase with a structure reminiscent of the Eiffel Tower in the background. It was enough to make me forget the $23 parking fee. Well, almost... It truly did set the proper tone for turn-of-the-century Paris. I'm hardly an expert on musicals, but I thought it was one of the best I've seen. The singing and dancing was quite good, and a few of the scene changes went by before I even noticed them. That means they were done well and the story was interesting. The orchestra was a little loud, especially in the first act, but that is why they do these pre-Broadway runs—to fine-tune the performance. I don't think they'll need to do a lot of work because I didn't see much that needs fixing! For those familiar with the movie or previous versions of the play, some songs have been added and others rearranged. What the director did seemed to work. My favorite songs are Thank Heaven for Little Girls, Paris Is Paris Again, The Night They Invented Champagne, and I Remember It Well. Set in the magical world of La Belle Epoque Paris--where fashion, glamour, and passion prevail--Lerner and Loewe's celebrated musical is a romantic comedy about one young woman's journey to find her true self... and her true love. Starring Vanessa Hudgens as Gigi, this Tony and Academy Award-winning musical features glorious songs such as "Thank Heaven for Little Girls," "I Remember It Well" and "The Night They Invented Champagne." Following its run at the Kennedy Center, this glistening, re-imagined production by Call the Midwife‘s Heidi Thomas and Follies director Eric Schaeffer will bring Gigi back to Broadway for the first time in 40 years! This highly anticipated, limited premiere engagement also features Tony Award winner Victoria Clark (The Light in the Piazza) as Mamita Alvarez, three-time Tony nominee Dee Hoty (Footloose) as Aunt Alicia, two-time Tony nominee Howard McGillin (The Mystery of Edwin Drood, Anything Goes, The Phantom of the Opera) as Honore Lachaille, Corey Cott (Newsies) as Gaston Lachaille, and Steffanie Leigh (Mary Poppins) as Liane d'Exelmans. "I can't imagine a better place to premiere this re-imagined production of Gigi than Washington. This city, designed by French-born architect Pierre Charles L'Enfant, is a perfect match for this wonderful show." Recommended for age 10 and up. Performance Timing: Approximately 2-1/2 hours, including one 20-minute intermission. All in all, I have to give it my recommendation. Clouds had covered the sky for weeks, and a misty drizzle soaked the fields. With the spring planting long overdue, it would soon be too late for the seeds to grow and bear fruit before harvest time. The high priest lifted his torch to the sky, an offering of light and warmth, to show the gods what his people needed. Their only reply was an indignant rumbling of thunder, the demand for a greater sacrifice delivered to the heavens by a messenger of smoke. As he placed the torch into a circle of dry tinder, lashed to a pole, I waited within for the flames to lift my spirit into the darkness. Some New Year's resolutions should be kept... I'm thinking this would be a good one for me. "Dad said he was going to start his exercise program today." "Yeah, the first day of the new year was when he was going to begin taking care of himself." "The doctor said he should have started long ago, but I guess it doesn't matter now." "Sure it does. Right after the funeral, what do say we both go for a long, brisk walk—and keep doing it every other day—so our kids don't have to have this conversation?" Many beginning writers are looking for places to submit work, and I like to post such markets when I find them, especially ones that are new to me. When I saw a post for Breaking Fate Publishing on Horror Tree, I decided to check them out. Horror Tree only had one of their requests listed, so I put the others out here with a link back to their site. BTW, Horror Tree is a great resource for horror writers. I haven't worked with these folks before, so this isn't a recommendation, but it shouldn't deter you from working with them, either! For those who do choose to submit, heed all the normal warnings that apply to dealing with any small publisher. And note, for short stories they pay with contributor copies. Good luck! What is our objective? To bringing frightening entertainment to the masses and to create new nightmares to fear. Let no bed be safe from terror. We are not a traditional publisher or company. We work with writers and artists of other dark mediums to publish materials that frighten and bring new fear into their psyche. We strive to work with the independents and we support independent rights. We are not a traditional publisher or company. We use sources that focus in POD printing and focus more heavily on digital publishing for Kindle and Nook platforms. We do push more for exclusive Kindle publishing due to certain restrictions but that decision is fully up to the other when publishing their work. We work with authors and we support independent artist rights. We independently publish each work and work with the author on releasing their work. We do not offer services that traditional publishers do, but work with authors and make suggestions to help them get their work ready for publication. We have editors and cover artists that we recommend when preparing their title, but in the end it is up to the writer to make sure they have their work prepared and ready for the masses to read. For what we do, we take 30% of earnings from each title sold and pass on all remaining sales profit to the author. All our contracts are non-exclusive and much of the rights for the work remain with the author. What are we looking for? We seek Dark Art Material. We use that term in a general reference towards, horror, supernatural, paranormal, dark fantasy, and horror erotica. We are looking for authors who are looking to independently publish their novel outside the traditional publishing systems. In addition to novel and novella length fiction, we also seek short fiction for horror anthologies. Guidelines: Our annual open submission period is from October 1st to May 31st. We look for all types of dark art fiction. We only accept email submissions. Please ensure that they are in .doc, .docx, .pdf, or .rtf formats. Submissions can be emailed to submit@breakingfatepublishing.com. Please when emailing a submission, to please include a short cover email with synopsis, and a brief bio (including previous publication credits, if any). Guidelines: Our normal open submission period for short fiction varies on anthology and dark art genre. Volume 2 – A collection of zombie tales to satisfy the hunger of any zombie (fan). Volume 2 – Road Trip Horror- Horror tales taking place on the road while traveling as well as commercial vehicle horror stories. – We are looking for 13 horror stories, all some way loosely around using the number 13 in a significant way. Be creative, make it interesting. We want to see what you can come up with. – A collection of sci/fi stories. Preferably creepy out of space stories. In the subject line of the email, please include the title of the anthology you would like to be included. If not included in the subject, submissions may be lost or confused with other anthologies. For all you astronomy / outer space fans, the link at the top of the page will take you to the Sky and Telescope website with charts for finding Comet C/2014 Q2 Lovejoy during the first couple of weeks of 2015! Perhaps it will inspire a new science fiction story in some of you. Now if it will only stop raining here so I can see it!